No, SQL Server is smart and knows it is being used for an EXISTS, and returns NO DATA to the system. If it was actually doing something with the SELECT list, it would throw a div by zero error. It doesn't. EDIT: Note, the SQL Standard actually talks about this. a) If the <select list> "*" is simply contained in a <subquery> that is immediately contained in an <exists predicate>, then the <select list> is equivalent to a <value expression> that is an arbitrary <literal>. The reason for this misconception is presumably because of the belief that it will end up reading all columns. It is easy to see that this is not the case. This shows that SQL Server was able to use the narrowest index available to check the result despite the fact that the index does not include all columns. The index access is under a semi join operator which means that it can stop scanning as soon as the first row is returned. So it is clear the above belief is wrong. However Conor Cunningham from the Query Optimiser team explains here that he typically uses SELECT 1 in this case as it can make a minor performance difference in the compilation of the query. The QP will take and expand all *'s early in the pipeline and bind them to objects (in this case, the list of columns). It will then remove unneeded columns due to the nature of the query. SELECT col1 FROM MyTable WHERE EXISTS (SELECT * FROM Table2 WHERE MyTable.col1=Table2.col2) The * will be expanded to some potentially big column list and then it will be determined that the semantics of the EXISTS does not require any of those columns, so basically all of them can be removed. "SELECT 1" will avoid having to examine any unneeded metadata for that table during query compilation. However, at runtime the two forms of the query will be identical and will have identical runtimes. I tested four possible ways of expressing this query on an empty table with various numbers of columns. SELECT 1 vs SELECT * vs SELECT Primary_Key vs SELECT Other_Not_Null_Column. As can be seen there is no consistent winner between SELECT 1 and SELECT * and the difference between the two approaches is negligible. The SELECT Not Null col and SELECT PK do appear slightly faster though. 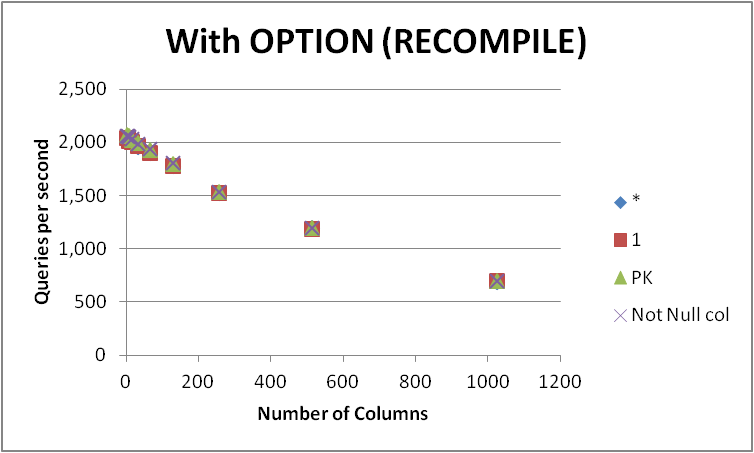 All four of the queries degrade in performance as the number of columns in the table increases. As the table is empty this relationship does seem only explicable by the amount of column metadata. For COUNT(1) it is easy to see that this gets rewritten to COUNT(*) at some point in the process from the below. This manual profiling attempt is backed up by the VS 2012 code profiler which shows a very different selection of functions consuming the compilation time for the two cases (Top 15 Functions 1024 columns vs Top 15 Functions 1 column). Both the SELECT 1 and SELECT * versions wind up checking column permissions and fail if the user is not granted access to all columns in the table. So one might speculate that the minor apparent difference when using SELECT some_not_null_col is that it only winds up checking permissions on that specific column (though still loads the metadata for all). However this doesn't seem to fit with the facts as the percentage difference between the two approaches if anything gets smaller as the number of columns in the underlying table increases. In any event I won't be rushing out and changing all my queries to this form as the difference is very minor and only apparent during query compilation. Removing the OPTION (RECOMPILE) so that subsequent executions can use a cached plan gave the following. Best way to know is to performance test both versions and check out the execution plan for both versions. Pick a table with lots of columns. There is no difference in SQL Server and it has never been a problem in SQL Server. The optimizer knows that they are the same. If you look at the execution plans, you will see that they are identical. Personally I find it very, very hard to believe that they don't optimize to the same query plan. But the only way to know in your particular situation is to test it. If you do, please report back! Not any real difference but there might be a very small performance hit. As a rule of thumb you should not ask for more data than you need. 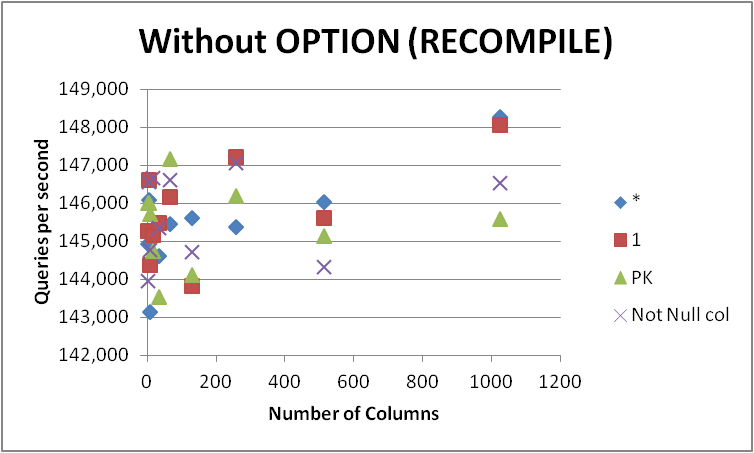 SQL Server: Is SELECTing a literal value faster than SELECTing a field? Can select * usage ever be justified? Where does the practice “exists (select 1 from …)” come from?